The Roman Catholic religion has a long tradition of having many saints within it, and that tradition has even passed over into the secular world, and into other religions. 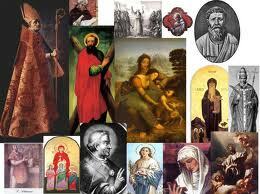 Roman Catholic saints are actually people who were once on this Earth, although many of them have long ago passed. Since that time, they have been honored for many, many years in the church and throughout the world. These individuals usually had a special interest or were particularly talented in one specific area, such as healing the sick or helping with matters of the heart. 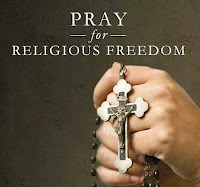 Roman Catholic saints are also considered to have the “ear of God” and praying to the saints, who can then pray to Jesus or God on behalf of the person, is thought in the Roman Catholic religion to be much more powerful than a mere human praying to God on their own. Statues can be found of Roman Catholic saints all throughout the world and those who are practicing Catholics often celebrate feasts on the day of a certain saint. Each saint typically has a date on the calendar where they are to be celebrated and honored, and Roman Catholics often recognize and celebrate on these days. Roman Catholic saints have become much more popular around the world, and not just in the Roman Catholic religion however. Many of the names of Roman Catholic saints are some of the most popular names that are chosen for baby names. There are also many different pieces of artwork, statues, and other monuments throughout the world that are all in dedication and remembrance of these saints. So it’s clear to see how influential these saints have been not just to one particular religion, but to the world as a whole ! The primary purpose of canonization is to officially authorize veneration and intercession of a particular saint. The investigation process that precedes canonization seeks primarily to ensure that the person is in heaven and God is working through him or her. The saint's relics (remains) are enclosed in vessels and publicly honored. First of all, a clarification : The Catholic Church doesn’t make saints like Hollywood makes movie stars. Catholics saints are men and women who lived holy lives in obedience to God’s will, and they became saints at the moment they entered heaven. 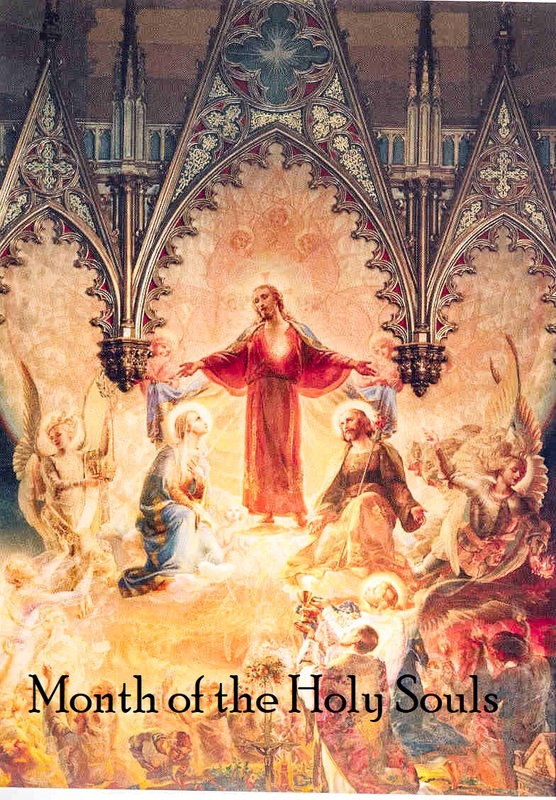 However, the Church does recognize those souls and that the Church can confirm that they are in heaven as saints. 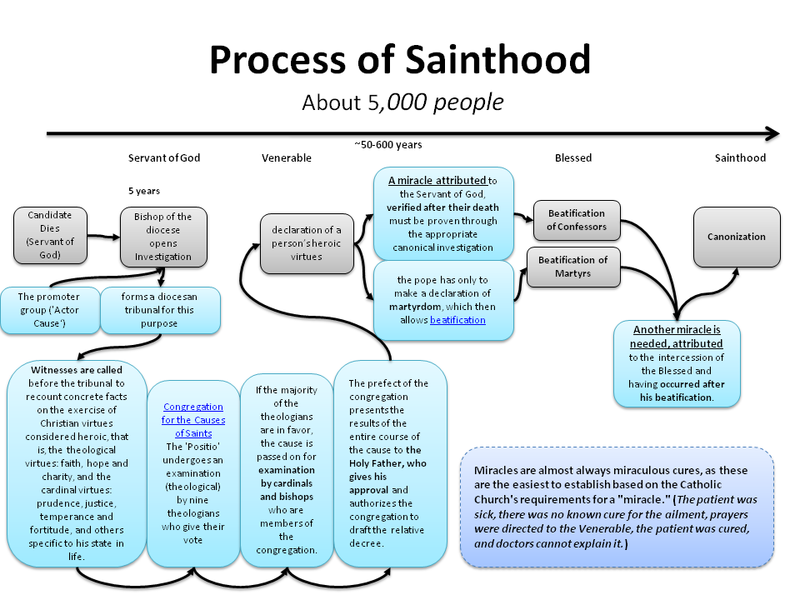 The process for being declared a saint is ancient, traditional, and often mysterious. Evidence must be presented to persuade Church officials that the person in question in fact lived a virtuous life, had faith, and had the support and help of God. The Church also looks at miracles as evidence that God is working through that person. The process of documenting the life and virtues of a holy man or woman cannot begin until 5 years after death. This waiting period insures that the person has an enduring reputation for sanctity among the faithful. It can be waived by the Supreme Pontiff, and has been done on two occasions. Pope John Paul II waived 3 years of the waiting period in the case of Mother Teresa of Calcutta, and Pope Benedict XVI waived all five years in the case of his predecessor, Pope John Paul II. 📄 SERVANT OF GOD : As soon as the person is accepted for consideration, she’s called a Servant of God. e.g. the Servant of God Karol Wojtyła or the Servant of God Pope John Paul II. During this first phase the Postulation established by the diocese, or religious institute, to promote the Cause must gather testimony about the life and virtues of the Servant of God. Also, the public and private writings must be collected and examined. 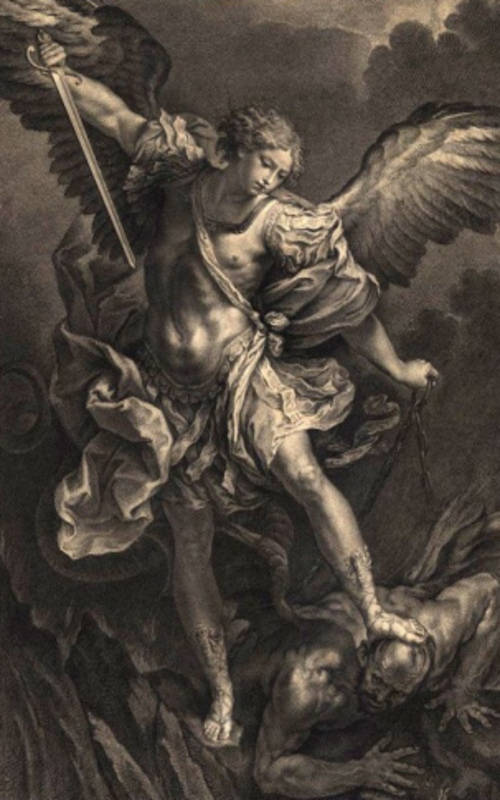 This documentary phase of the process can take many years and concludes with the judgment of a diocesan tribunal, and the ultimate decision of the bishop, that the heroic virtues of the Servant of God have or have not been demonstrated. The results, along with the bound volumes of documentation, or Acta (Acts), are communicated to the Congregation for the Causes of the Saints. The Acta resulting from the documentary or informative phase of the process are committed by the Congregation to a Relator appointed from among the Congregation's College of Relators, whose task is to superintend the Cause through the rest of the process. Working with a theological commission established by the Congregation, the Relator ensures that the Positio summarizing the life and virtues of the Servant of God is properly prepared. When the Positio is finished, the theological commission votes affirmatively or negatively on the Cause. This recommendation is then passed to the cardinal, archbishop and bishop members of the Congregation who in turn vote. Their vote determines whether the Cause lives or dies. If the vote is affirmative, the recommendation of a Decree of Heroic Virtues is sent to the Holy Father, whose judgment is final. Once the person's Heroic Virtues have been recognized by the Pope, they are called Venerable, e.g. Venerable Servant of God John Paul II, or Venerable John Paul II. The remaining step before beatification is the approval of a miracle, evidence of the intercessory power of the Venerable Servant of God and thus of his or her union after death with God. Those who propose a miracle do so in the diocese where it is alledged to have occurred, not in the diocese of the Cause, unless the same. The diocese of the candidate miracle then conducts its own tribunals, scientific and theological. With the beatification rite, conducted on the authority of the Supreme Pontiff, the Venerable Servant of God is declared Blessed, e.g. Blessed John Paul II. Blesseds may receive public veneration at the local or regional level, usually restricted to those dioceses or religious institutes closely associated with the person's life. "Public veneration" in this use of the term doesn't mean that it is done in public; rather,that it is an act done by the clergy, or delegated laity, in the name of the Church (Mass, Divine Office, images in churches etc. ), even if done in private. On the other hand, "private veneration" means veneration by individuals or groups acting in their own name, even if done "in public." While the Church restricts the public venration of Blesseds, Catholics are free to privately venerate them. In the case of Blessed John Paul II, the Holy See in a Decree Concerning the Liturgical Cult of Blessed John Paul II has determined that public veneration is lawful in the Diocese of Rome and the nation of Poland. Other nations, dioceses and institutes may petition the Congregation for Divine Worship and the Discipline of the Sacraments for the Indult to render cultus (veneration) to the Blessed. Without an Indult, however, public veneration is illicit, and even harms the possiblility for Canonization of the Blessed. After beatification the Church looks for a second miracle before proceeding to canonization. The process is the same as it was for the miracle which made beatification possible. The alleged miracle is studied by scientific and theological commissions in the diocese in which it is alleged to have occurred. By the Rite of Canonization the Supreme Pontiff, by an act which is protected from error by the Holy Spirit, elevates a person to the universal veneration of the Church. 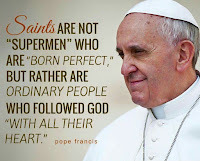 By canonization the Pope does not make the person a saint. Rather, he declares that the person is with God and is an example of following Christ worthy of imitation by the faithful. A Mass, Divine Office and other acts of veneration, may now be offered throughout the universal Church. If the saint has some universal appeal he may be added to the general calendar of the Church as a Memorial or Optional Memorial. If the appeal is localized to a region of the world, a particular nation, or a particular religious institute, the saint may be added to the particular calendars of those nations or institutes, or celebrated by the clergy and faithful with a devotion to the saint with a votive Mass or Office. If the thorough background check leads the investigators to declare the candidate venerable, evidence of miracles attributed to the candidate’s intercession with God is sought. Miracles need to be documented and authenticated, so eyewitnesses alone are considered insufficient. Medical, scientific, psychiatric, and theological experts are consulted, and evidence is given to them for their professional opinion. If a scientific, medical, or psychological explanation exists for what had only appeared to be a miracle, then it isn’t an authentic miracle. Only immediate, spontaneous, and inexplicable phenomena are up for consideration as authentic miracles. If a person is martyred for the faith, miracles are not necessary to be declared a saint. As mentioned above, the purpose of canonization is to verify that the person is now in heaven, and all those who die as martyrs are believed to go straight to heaven. For those who died naturally, however, at least one miracle is necessary to be declared Blessed (beatified) and at least two miracles are necessary to be declared a saint (canonized). These miracles must have occurred after the person's death (to demonstrate that the person is in heaven and able to assist the living), but miracles during his or her lifetime are also taken into account as evidence of God's favor. When considering a reported miracle, the Church often consults with medical, scientific and theological experts to see if there might be alternative explanations. 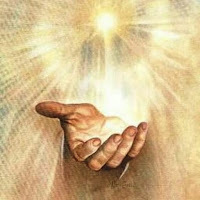 If the experts can find no explanation, they report that to the Church (they do not declare the event to be a miracle, just that they could find no natural explanation). Healings : attributed to intercession of the saint or contact with relics. Incorruptibility : Long after the saint is dead, the body is found free of decay when exhumed from the grave. The Church considers St. Catherine of Siena to be an example. She died in 1380, and 600 years later without any embalming, her flesh hasn’t decomposed. Liquefaction : The dried blood of the saint, long dead, miraculously liquefies on the feast day. The Church considers St. Januarius (San Gennaro in Italian; A.D. 275?–305), the patron saint of Naples, to be an example. According to the Church, a vial of his dried blood liquefies every year on September 19. Odor of sanctity : The body of the saint exudes a sweet aroma, like roses, rather than the usual pungent stench of decay. The Church considers St. Teresa of Avila (1515–82) to be just such an example. The Church believes her grave exuded a sweet fragrance for nine months after her death. The pope alone decides who is publicly recognized as a saint in churches all over the world and gets a feast day. 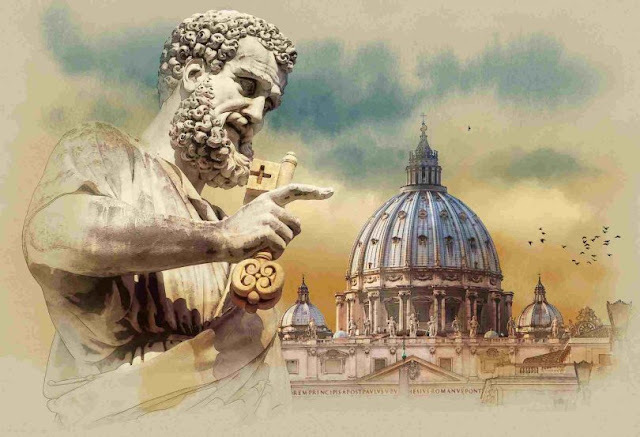 The actual act of beatification, in which a person is declared blessed, or of canonization, which is officially recognizing a saint, usually takes place in St. Peter’s Square outside the Vatican and St. Peter’s Basilica. Sometimes, though, the pope beatifies and canonizes in the country where the person lived and died, as in the case of St. Juan Diego. He was an Aztec peasant, and the Church believes Mary, as Our Lady of Guadalupe, appeared to him in Mexico in 1531. In his case, 12,000 people were present in the Basilica in Mexico City, and 30,000 waited outside, watching on video monitors. Abstract : Physicians play a very important role in the theological processes known as beatification canonization in the Catholic Church. In the first millennium of the Christian era, martyrs and other individuals who lived exemplary lives of Christian perfection in the opinion of the faithful in their locale were venerated as holy persons who had already obtained heaven upon their deaths. Thus, “saints” and their cults were created by action of local Christian communities. Bishops gradually recognized that such action was neither in the best interests of the local community of faithful Christians nor of its Church and Bishop. The creation of “saints” by local acclamatory action often leads to error, scandal, and heresy. In the beginning of the second millennium of the Christian era, the Popes gradually centralized this theological process under their direction. In the process which was developed, physicians were an essential group in certifying to the ecclesiastical authorities that a physical cure produced by a miracle was inexplicable by current medical knowledge. This paper subsequently describes this process of development as well as the special role of physicians in it. The canonization process of the Catholic Church is a theological activity in which physicians play a very important role. To understand this role, however, one must know the history of the development of the beatification and canonization processes and the evolution of the physicians’ role therein. In the first three centuries of the Christian era, the Church was beset with persecutions which were instituted by various Roman emperors. Death was the penalty for any citizen or slave in the empire who did not sacrifice to the emperor as a God. Christians refused to do this. Such action would be a public denial of their belief in the one true God. Many suffered martyrdom in these persecutions. In the fourth and fifth centuries, repeated invasions into the northern territories of the empire by Germanic tribes from Eastern Europe (Visigoths, Vandals, and Franks) occurred. Later, in the fifth century, Slavic tribes from the east invaded the eastern territory of the empire. The chiefs of these various tribes ordered the killing of Christians who proselytized tribal members. These slaughtered Christian heroes were known as martyrs for the Faith. Often at the grave site of such a martyr, the faithful would leave tokens of reverence in honor of their heroic action in choosing death over apostasy. 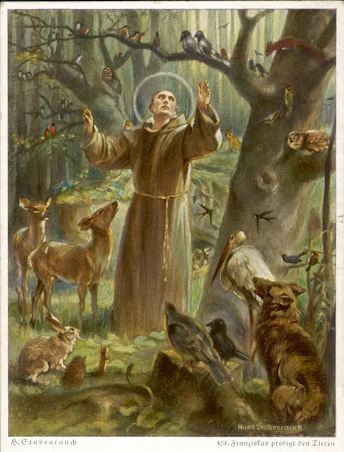 The faithful universally believed that by dying a martyr’s death, the individual went straight to heaven, seeing God directly “face to face.” Thus a martyr was a “saint.” Gradually the belief developed that such “saints” could beseech God to give help to a living individual. The faithful living near a martyr’s grave might pray to the martyr for an intervention to God to grant some favor, eg, a cure of an illness, provision of fruitful harvests, safe deliverance of a child, etc. Expressions of devotion to a particular “saint” gave rise to the expression “a saint’s cult” (cultus—the Latin term for honor), which came to define that group of the faithful who venerated a particular “saint.” This veneration often spread to more distant churches whose congregation would also become cult members, often requesting in prayer the “saint’s” intervention to God for a favor. Throughout Christendom, in the first millennium of the Christian era, deceased persons were initially declared “saints” by local communities rather than by central church authorities. Bishops realized that this process of creating “saints” by local acclamation and the development of local cults could lead to error, scandal, and heresy. At the Council of Carthage in 419 A.D., the bishops of northern Africa attempted to regulate this process. A martyr whom the peoples’ cult called “saint,” they argued, should first be recognized and investigated to some degree by the bishop of that territory where the grave or tomb was located to prove sanctity of person and truth of the divine intervention through the testimony of living witnesses.1 Only then should the faithful venerate the individual as a “saint” and seek interventions for a favor from God. The bishops thus became involved in the process of naming martyrs “saints” by investigating and accepting as valid claimed interventions (miracula—Latin for “splendid wonders”) by one or another member of that bishop’s flock. The “saint” could then be venerated in that diocese. That bishop, however, could not ask the faithful of the universal Church to recognize that martyr as a “saint.”Only a Pope has this authority. The Church’s process of recognizing a saint is called beatification and canonization. The Church does not create saints. The Church simply applies the standard of holiness of life to certain individuals who lived exemplary Christian lives and through this lengthy process of prayer and study have declared that the individual is in heaven. One way for God to affirm the presence of an individual in heaven with Him is through the performance of miracles through the intercession of that person. 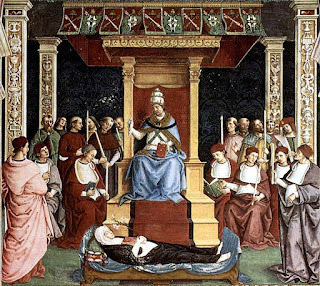 There was no set formula in the Church for these processes until Pope Gregory IX (1227–1241) in 1234 regularized for the universal Church (ie, not just local dioceses) the procedures for investigating the life of a candidate for sainthood as well as authenticating any miracles attributed to that individual’s intervention with God. He insisted there be eyewitnesses to any claimed miracle of a physical nature. 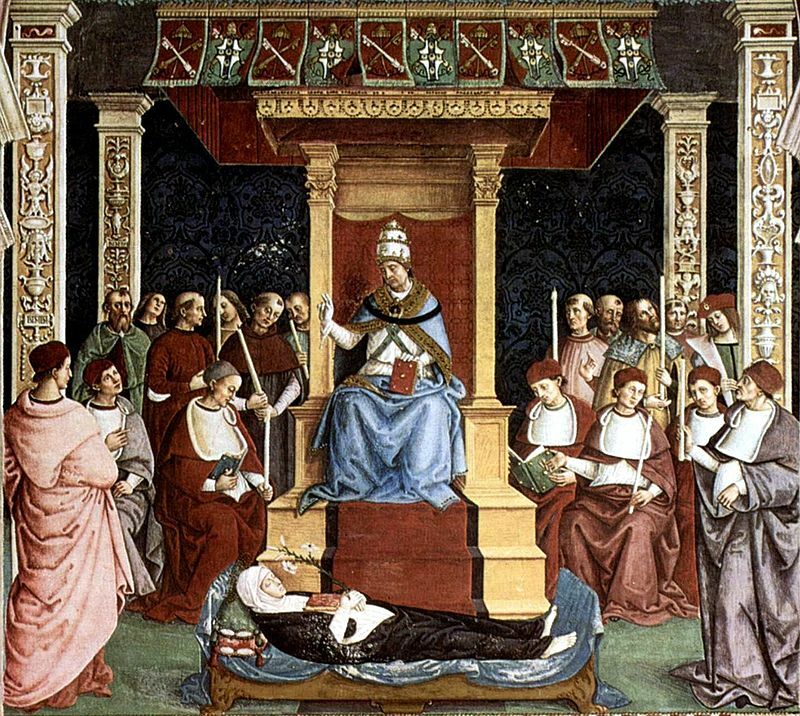 By the time of Pope Gregory IX many bishops had begun to request physicians to authenticate cures attributed to a given “saint’s” intervention. Such a practice was not defined by canon law and thus it was not universally applied. This situation continued to exist up to the end of the 16th century. A famous Roman physician, Paolo Zacchia, attempted to deal with this problem in his monumental treatise Quaestiones medico-legales first published in 1621. His conclusions were so highly considered by the theologians of the Sacred Congregation of Rites that they adopted them for assessment of miracles. From this time on by initiative of the Sacred Roma Rota (the second highest ecclesial court in the Church) under the direction of Pope Urban VIII (1623–1644) it became obligatory to have medical experts in the examinations of miracles. As a consequence of Urban VII’s reforms, Pope Innocent XI (1676 –1689) prepared and issued his famous decrees of 15 October 1678, which set the fees for all ministers involved in the proceedings and made the examinations of alleged miraculous cures strictly scientific in nature. At the beginning of the 17th century the requirements of a miraculous cure and its recognition were explicitly taken into consideration by the Sacred Congregation of Rites. Benedict XIV (1740 –1750), as Cardinal Prospero Lambertini, Promoter General of the Faith in the Congregation of Rites before his election to the papacy, wrote in 1740 exact directions for all the steps in the beatification and canonization process. Included in these instructions were the exact procedures to be followed by the medical experts called upon to assist in the evaluation of the so-called miraculous cures. The Popes of the 20th century insisted that physicians have a greater and more definitive role in the beatification and canonization process. Firstly, the norms of the process set forth by Benedict XIV were incorporated into the code of Canon Law of the Church in 1917 by Benedict XV (1914– 1922). He added a new and important requirement, ie, that a medical expert must always be included among the members of any tribunal in charge of gathering information on a “presumed” miracle at the diocesan level. Such physicians need not be Roman Catholics. Any physician of any faith or of no faith may give medical evidence at this level of investigation. Pius XI (1922–1929) created a historical section within the Congregation of Rites to study “historical” causes in accordance with the dictates of the then new techniques of historical form criticism in his Apostolic Letter Gia da qualche tempo issued motu proprio 6 February 1930. In 1939 he abandoned the process called “apostolic authority” and ordered a single process to be conducted with ordinary authority in these “historical” causes. Pius XII (1939 –1958) created a Medical Commission (Consulta Medica) on 22 October, 1948 to advise theologians of the Congregation of Rites when they were evaluating medical miracles. 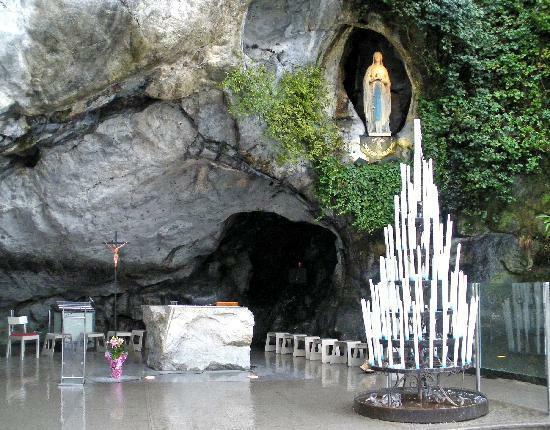 Its work was modeled after the Medical Commission established in 1884 at the Marian Shrine at Lourdes, France. He made mandatory that the theologians of the Congregation always seek and abide by the opinion of the physicians of the Commission, whether an alleged medical miracle is unequivocally inexplicable by current medical science. John XXIII (1958 –1963) made some minor changes in rules governing the activities of the Medical Commission on 10 July 1959. Paul VI (1963–1978) in 1969 divided the Congregation of Rites to create two new dicasteries (ie, official Vatican bureaus). He named one the Congregation of the Causes of Saints with three distinct offices—the judiciary, the Promoter General of the Faith and the historical-juridical, a continuation of the historical section created by Pius XI. 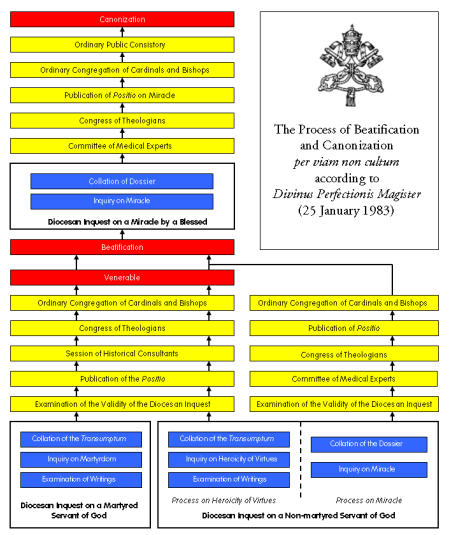 In 1983 John Paul II (1978 –2005) promulgated canon norms for exact procedures to be followed for causes of saints from the initiation of the process by a local bishop to the actual rite of canonization by the Pope. He also added a College of Relators to prepare cases of those declared Servants of God, the first step in the canonization process.16 In section I describing the activities of local bishops, norm 22 directs that inquiry into alleged miracles must be conducted separately from the inquiry into virtues or martyrdom.17 In section II, describing the norms for the Congregation, norm 8 directs that one of the Relators shall be especially selected to prepare the positions on miracles. He is to take part in the meetings of the physicians and of the theologians. The physician-consultants of the Medical Commission are appointed by the Prefect of the Congregation for the Causes of Saints. There are some 60 who are selected mostly from among the outstanding professors, department chiefs, or chief medical directors in the various university hospitals in Rome or other cities of Italy. Occasionally a medical consultant of another nationality is asked to serve as a special consultant and expert witness for the Medical Commission to deal with special cases. All must be Roman Catholics. They represent many different specialties. Their duty is to determine whether any alleged medical miracle (most all clamed miracles are of this sort) is inexplicable by current medical science. Biweekly for nine months of the year, different panels consisting of five members of the Commission meet in the offices of the Congregation and examine the alleged miracles claimed in two cases. For each case studied, the member is paid a fee of about $500. All medical and hospital records obtained in the process are made available to the examining physicians. Submitted medical testimony is accepted at face value from all legitimately licensed medical personnel of any race or religious persuasion, including atheists. All x-rays, reports of laboratory tests and pathologic studies collected are made available, as are written testimonies of the alleged miracle from the subject, from eyewitnesses, and from the individual who invoked the intercession of the involved “blessed” person. The physician’s preparation for the panel meeting is very time consuming. The records are extensive and x-rays and laboratory reports numerous. Done in isolation, the preparatory work of the consultant requires at least twenty-five or thirty hours per case. Medical Commission, the theologians consider all other information which has come to the Congregation and is related to the alleged miracle. They recommend to the Cardinal members of the Congregation to accept or reject the action as a true miracle. If the Cardinal members conclude that all the evidence indicates an intervention by God, they will recommend to the Pope that he canonize the Blessed who interceded for the supplicant. By the procedure of canonization, the performance of which is reserved for the Pope alone, the Church proclaims its recognition that a certain individual has demonstrated actions proving infallibly that individual’s blessed existence in heaven with direct knowledge of God. The faithful justifiably call such an individual a Saint! Indeed, the input of physicians in the work of the Congregation for the Causes of Saints is essential and pivotal, for it is they alone who determine if an alleged physical miracle has actually occurred. Without a positive finding on their part the process of beatification and canonization cannot go forward. 1. Blather DJ. The Ordinary Processes in Causes of Beatification and Canonization. Washington, DC, The Catholic University of America Press, 1949. 2. Cunningham LS. The Meaning of Saints. San Francisco, CA, Harper & Row, 1980. 3. Delehaye SJ. The Legends of the Saints. South Bend, IN, University of Notre Dame Press, 1961. 4. Harris R. Lourdes: Body and Spirit in the Secular Age. New York, NY, Viking, Penguin Putnam, 1999. 5. Kemp EW. Canonization and Authority in the Western Church. London, Oxford University Press, 1948. 6. Macken TF. The Canonisation of Saints. Dublin, MH Gill & Son, Ltd, 1919. 7. Molinari SJ. Paul. Saints: Their Place in the Church. New York, NY, Sheed and Ward, 1965. 8. Woodward K. Making Saints. New York, NY, Simon and Shuster, 1990. 1. A Synod at Carthage in Africa. Migne. Patrologia Latina. (Tom.LXVII., col. 181) Canon LXXXIII “Of False Memories of Martyrs” 419 AD. 2. Gregory IX. Nova compilation decretalium, 1234. 3. Sixtus V: Const. apost. Immensa Aeterni Dei, 22 Jan. 1588. Bullarium Romanum, ed. Taurinensis, t.VIII, pp 985–999. 4. Zacchia, P. Quaestiones medico-legales. 1st ed., Rome, 1621. 5. Urban VIII, Apostolic Letter. Caelestis Hierusalem Cives, 5 July 1634. 6. Urban VIII, P.O.M. Decreta Servanda in Beatificatione et Canonizatione Sanctorum, 12 March 1642. 7. Innocent XI, Apostolic Constitution. Nova Compilatio Decretalium, 15 Oct 1678. 9. Benedict XV. Apostolic Constitution. Providentissima Mater Ecclesia. 27 May 1917, AAS 9/2, 1917, pp 11–521. 10. AAS 22, 1930, pp 87–88. 11. AAS 31, 1939, pp 174–175. 12. Molinari, Paolo, S.J. De Necessitate Miraculorum in Beatif. Et Canoniz., Journ. Canon Law-Gregorian University [Periodica], Vol. 63, 1974, p380, footnote #25. 13. Antonelli, O.F.M., P.F. De Inquistione Mecdico-Legali Super Miraculis In Causis Beatificationis Et Canonizationis, Studia Antoniana: Cura Pontificii Athenaei Antoniani Edita, Rome, 1962. 14. Sacred Congregation of Rites. Regolamento della Consulta medica presso la Sacra Congregazione dei Riti.10 July 1959. Tipografia Poliglotta Vaticana, 1959 Appendix III, Articles I-24. 15. Paul VI. Apostolic Constitution, Sacra Ritum Congregation, 8 May 1969. AAS 61, 1969, 149–53. 16. John Paul II. Apostolic Constitution, Divinus Perfectionis Magister, 25 January 1983. 17. Sacred Congregation for the Causes of Saints. Norms To Be Observed By Bishops When Making Investigations In Causes of Saints. 7 Feb. 1983. 18. Benedict XVI. Letter to the Participants of the Plenary Session of the Congregation for the Causes of Saints. 24 April 2006.